Samuel Amadon used to live in Hartford, but now he writes poems. His fears include fire, darkness, bees, accidentally drinking glass, the color orange, crossing the street at an inappropriate time, people hiding behind his shower curtain and Russia. He is still grateful to Blaize Lehane for the bat. Jane Ortrun Carver is an artist and musician who has abandoned all previous hopes and dreams of mastering the shell game. Jeff Chang's poems have appeared or are forthcoming in Maisonneuve, Swink, Mangrove and Pool. He lives in western Massachusetts and eats poultry twice a year. Adam Clay lives in northwest Arkansas and co-edits Typo Magazine. His recent poems are forthcoming in Barrow Street, CutBank, LIT, New Orleans Review, and elsewhere. John Cross currently lives in Los Angeles with his wife Christine. His poems have appeared in Absomaly, Pool, Volt and New American Writing. Eileen Conner holds an MFA in poetry from the University of Michigan. She likes cooking and eating what she cooks. Mark DeCarteret has worked as a farmhand (dueled w/pesticides & pitchforked mice1); ice cream scooper (supplied w/low-grades speed by assistant manager); machinist (stigmatized by high-speed grinding wheel); fruit-picker; lab animal caretaker (wore company-issued underwear & mucked out cages w/a metal ruler & dustpan); landscaper; homeless shelter staff member; tilesetter (ran own company for twelve years2); carpet installer; book store clerk (rang up customers2) and a teacher. 1. Only the author was intentionally hurt in the making of this biography. 2. Notice how anecdotes become less appealing as the author ages. Darcie Dennigan wrote to Forklift, Ohio to inquire about the handling and/or mishandling of some industrial lighting. She is confused yet delighted to see her questions published here as a whole slew of poems. DJ Dolack is the founder of Eye For An Iris Press, and an original member of Bostons Guerilla Poets. His most recent work can be found in The Columbia Poetry Review, Salt Hill, and online at thediagram.com. Check outwww.blackocean.org and www.eyeforaniris.com. Hello New Jersey, Boston, Asheville, and now Brooklyn. Thanks for reading. Tim Earley was born and raised in the foothills of Western North Carolina. He received his M.F.A. in Creative Writing from the University of Alabama, where he also taught English and poetry workshops for a number of years. He has been the recipient of two Writing Fellowships from the Fine Arts Work Center in Provincetown. His poems have appeared or are forthcoming in Chicago Review, jubilat, Hotel Amerika, La Petite Zine, Hayden's Ferry Review, Southern Humanities Review, Typo, DIAGRAM, and the Green Mountains Review issue, Comedy in Contemporary American Poetry. 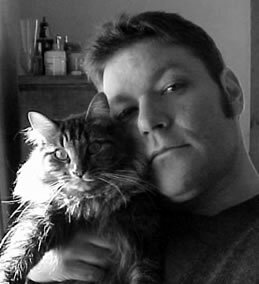 He lives and teaches in Hickory, North Carolina with his partner, Sallie Anglin, and their variegated collection of cats. Zack Finch is in the Poetics Program at SUNY Buffalo. He was a 2003-4 poetry fellow at the Fine Arts Work Center in Provincetown. Poems recent or forthcoming can be found in Poetry, Tin House and American Letters & Commentary. Lisa Fink lives in Minneapolis where she writes poetry and essays and studies the ethnology of diving birds and housecats. Her poems have been published or are forthcoming in Spinning Jenny and Spout. Dobby Gibson's first book, Polar, is just out on Alice James Books. He patrols the skies above Minneapolis. Kevin R. Hollo teaches and studies at Miami University in Oxford, Ohio. He is currently the fiction editor atOxford Magazine, a web-based review which is undergoing a beautiful facelift with much swan-ness planned for 2005.His poems have appeared in the Cafe Review among others. Dan Kaplan's poems recently appeared or are forthcoming in Barrow Street, Spinning Jenny, Octopus, Third Coast, Pool, and elsewhere. His chapbook Skin, a letterpress, bilingual edition produced in collaboration with Cuban artist Julio Cesar Peña and translator Maria Vargas, will be published by Red Hydra Press in 2005. Someday he will wear a lobster suit to a board meeting. Someday. Mary Leader is the author of Red Signature (Graywolf Press, 1997) and The Penultimate Suitor (University of Iowa Press, 2001). Matthew Lippman lives in Spencertown, NY. He is the recipient of the Kathryn A. Morton Poetry Prize from Sarabande Press. His book The New Year of Yellow will be published in January 2007. Recent poems will be appearing in The Literary Review, Margie and The Seattle Review. Matt Lombardi graduated with a B.F.A. in Writing from Emerson College in 2003. His most recent work has been published in the April issue of Details magazine. He is currently living in Brooklyn, NY and writing an imaginary cookbook. Rebecca Loudon is a violinist and poet, whose first collection Tarantella was published by Ravenna Press. She lives in Seattle, Washington. John Lundberg's poems have appeared or are forthcoming in Poetry, Virginia Quarterly Review, and The Threepenny Review. He just finished a Stegner Fellowship at Stanford University. Sabrina Orah Mark's first book of poems, The Babies, won the 2004 Saturnalia Books Poetry Prize (judged by Jane Miller), and was recently published by Saturnalia Books. Ted Mathys's first book of poetry, Forge, is now available from Coffee House Press. Hes from Ohio and lives in New York. Stan Mir has published work in previous issues of American Letters & Commentary, eratio, Fence, Octopus, andWord for/Word, among other journals. Kirsta Mosconi published poetry in high school and honed her poetic skills while earning a B.A. in English at Colorado College. Now back in Tucson, AZ, she works as a middle school Language Arts teacher and as the University of Arizona Poetry Centers pied piper of poetry for children. She often uses emus to get the literary point across. Any accolades for this work must be passed on to the preschoolers at Second Street School, without whom none of this would have been possible. Daniel Nester is the author of God Save My Queen (Soft Skull Press, 2003) and God Save My Queen II (2004), both prose poem collections about his obsession with the rock band Queen.His work has appeared in jubilat,Crazyhorse, Spoon River Poetry Review, and Best American Poetry 2003 among other places.He is editor of the online journal Unpleasant Event Schedule and is assistant web editor for sestinas at McSweeneys magazine. Ethan Paquin is the author of Accumulus (Salt, 2003) and the forthcoming The Violence (Ahsahta, 2005). He is editor of Slope and Slope Editions, and directs the undergraduate creative writing program at Medaille College in Buffalo, NY. He is a native of New Hampshire. Cami Park's work can be found in publications such as Smokelong Quarterly, Outsider Ink, No Tell Motel, Opium Magazine, Mad Hatters Review and Ghoti Magazine. Brett Price is a student at the University of Cincinnati where he helps edit the undergraduate poetry journal,Shortvine. He likes Skydiving and The Andy Griffith Show. Nate Pritts is the editor of H_NGM_N & the author of three chapbooks of poetry; the most recent, THE HAPPY SEASONS, is available online from Swannigan & Wright.Other poems have been in/will be in Southern Review, POOL,42opus, Pacific Review, DIAGRAM, StorySouth, horse less review & Unpleasant Event Schedule among others.He lives in Natchitoches, LA, with his wife Rhonda, & their kids Kate, Dylan & Laney (& Oscar the dog). Virgil Renfroe likes to zap his mugs of milk with microwaves before he puts in the right amount of sugar and coffee. He lives in Greensboro, NC and teaches at NCA&T and UNC-Greensboro. Anthony Robinson lives in Oregon where he used to operate an industrial seat press. His ex-girlfriend wont speak to him. luckyerror.blogspot.com. Roger Sedarat has published scholarly articles on American poetry, and his verse has appeared in such journals as New England Review, Barrow Street and Atlanta Review. He currently teaches literature and writing at Borough of Manhattan Community College. Marcus Slease is a native of Portadown, Northern Ireland. He currently teaches existentialism, Beat literature, and intro to film classes at UNC-Greensboro and is a member of the Lucifer Poetics Group. You can read his blog at www.marcusslease.blogspot.com. Hugh Steinberg lives in Berkeley, California. A past recipient of an NEA creative writing fellowship, he teaches at California College of the Arts and is the editor of Freehand, a new journal devoted to handwritten work. Shane Sullivan was a great poet who lived and loved BIG. He passed away in May of this year. He was 36 years old. Addie Tsai is proud to say that she no longer works for the man, aka the corporate devil. She just received her MFA from Warren Wilson College, and teaches small (and large) children in Houston, Texas. Addie has been published in can we have our ball back?, Four Corners, and The Allegheny Review. She has shoulder-length black hair, a round face, and colored glasses. Nevertheless, she is often mistaken for her evil twin sister Emma, who has a dyed-red Sharon Stone head and a small square face with freckles. F. Keith Wahle received an MFA in 1974 from the University of Iowa Writers' Workshop. His poetry books include:A Choice of Killers (1998), Farewell to Happy Town (2003), and The Invitations (2005). Most recently, his poems and prose poems have appeared in Cincinnati Poetry Review, Incliner , Inscape, Lake Effect, Pudding, andSojourn. Joni Wallace's info was returned to sender. Last we knew she was living in Tucson, AZ. Somebody please find her, and tell her we have her asparagus. Derek White has other recent or forthcoming text, art and text/art in Denver Quarterly, Post Road, Café Irreal, Avatar Review, Aught, Word Riot, Diagram, Prague Literary Review, perspektive and XCP. He edits SleepingFish and works as a freelance writer/editor in NYC. Ian Randall Wilson is the managing editor of 88: A Journal of Contemporary American Poetry. Recent poetry and fiction have appeared in Puerto del Sol and the North American Review.His first collection, Hunger and Other Stories, was published by Hollyridge Press.